Dust gas into the air inlet through the hopper, part of the larger particles in gas dust separated by the effect of inertia force, directly into the bottom ash hopper. Dust gas through ash hopper roar into the body of filter areas,then gas pass filter bags and dust trapped on external surface of the filter bags. After purification, the gas after filtering on the mouth into the box, discharge from the air outlet. Longer duration of filter, filter bags dust layer become thickness, increasing resistance of dust , when the resistance rises to the set data ,ash removal device start working. Gas down to the dust fall into ash hopper, discharge by the ash hopper. Elegant & splendid：Whole machine are made from full stainless steel including draught fan, it is accord with working environment of food grade. High efficiency：The single drum filter of folding micron grade can absorb more powders. Strong strength：Special design of multi blade wind wheel with more stronger suction ability. 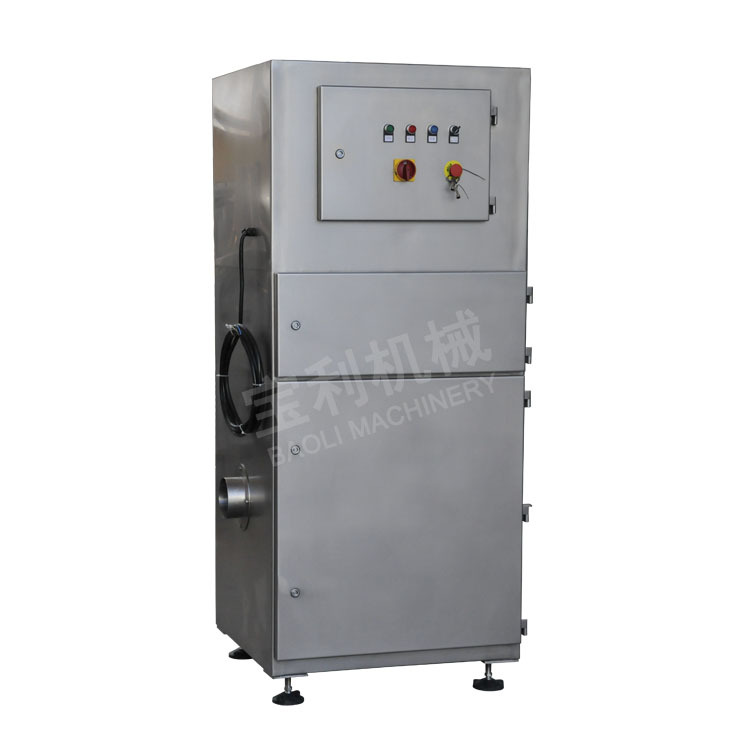 Convenient cleaning：One-key type vibration cleaning powders, be more efficient to remove the powders which attached the cylinder filter, clean dusts efficiently. Hommization：Adding remote controlling system, be convenient to distance controlling equipment. Lower noises：Special insulation cotton reduce noises more efficiently.